Raise the question of whether Santa Barbara supports a “genuine” (whatever that means) contemporary art scene, and you are likely to set off a debate. Some will say that it’s too expensive for young artists to live and work here, while others will insist that it’s too beautiful here for artists of any age to remain motivated, and still others will refer to Brooklyn, Portland, and downtown Los Angeles as examples of locations where, unlike Santa Barbara, there are enough artists to reach the critical mass necessary for a true scene to form. Fortunately, there are plenty of actual artists who ignore the perspectives outlined above and pursue their work regardless of the expense, the beauty, and the perceived un-Portland-ness of our city. SBCC Atkinson Gallery director Dane Goodman has put together a show that features the work of six such artists — Elizabeth Folk, Saul Gray-Hildenbrand, Kimberly Hahn, Zacarias Paul, Steven Soria, and James Van Arsdale — who share an industrial studio space in Goleta and go by the name of the Can(n)on Group. Saul Gray-Hildenbrand's “Precipice #3” (detail) is one of five pieces the artist has installed on the Atkinson Gallery's deck overlooking the city. They are an eclectic mix, and, in addition to working in close proximity to one another, they share certain tendencies that link them to other contemporary artists around the country and around the world. Take, for example, Folk’s mixed-media sculpture called “it couldn’t get any worse or be any better” of 2012. A trio of life-size human figures dressed in pale purple stand in the middle of the gallery floor, their heads obscured by a single sparkling version of a conventional camping tent. From somewhere within this enigmatic construction, recorded voices emerge speaking at a low volume in a kind of babble that remains frustratingly unintelligible. The voices are recordings of speech therapy classes, and the overall effect of the piece is at once whimsical and profound, offering the viewer a tantalizing metaphor for communication that never quite completes its meaning. Across the room in one direction, Hahn has created a dramatic and visually seductive installation out of the photographer’s white-balance backdrop. The piece, called “A Complete Fiction” (2012), demonstrates the unreality at the heart of conventional photographic representations of light. Each shade on the giant “white” sheet intends to reproduce a specific type of white under certain light conditions — direct sunlight, flash, LED, shade, blue sky, tungsten, cloudy, and even candle. Flanking the sensuous single sheet is a series of imaginary “color checker cards,” again sending the message that what you see is not necessarily what you have, or what you will get. Soria’s shelf of trophies takes a different approach to the complex problems raised by conventional forms: in this instance, the social rituals of recognition. On the opposite wall, another Soria piece, this one in the form of a fill-in-the-blank plaque called “How to ____ your own or anybody else’s _____.” (2012) further upends expectations with regard to presentation and content. Van Arsdale’s majestic installation ode to heavy metal ought to inspire nostalgia in anyone who lived through the heyday of Black Sabbath and Iron Maiden, while Paul’s elegant and festive geometric color field paintings on driftwood are simply irresistible objects in their own right, capable of sustaining any number of associations, or none at all. Finally, Gray-Hildenbrand has succeeded in creating the most successful sculpture that’s been placed on the Atkinson Gallery patio in recent memory. 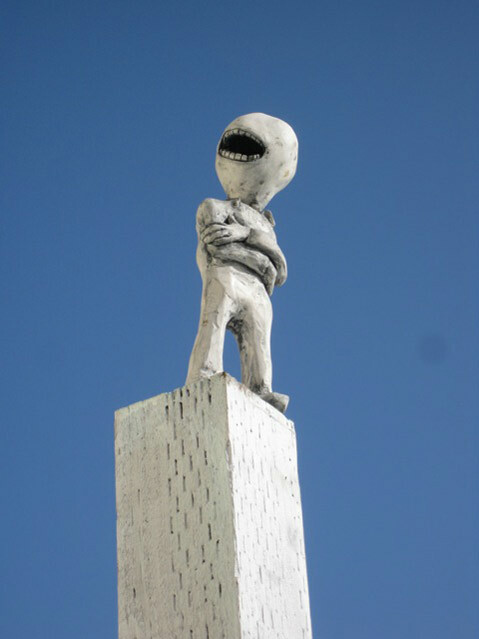 “Precipice 1-5” consists of five tall verticals, each topped with a tiny human figure in some sort of precarious pose. Against the backdrop of the Riviera, these avatars form an indelible image of what it is to live and work here in the West Coast’s ultimate garden by the sea.